Who named these holidays? Shrug. But, if I wanted to take a guess, I would say that the three holidays mentioned above were created by marketing teams at the National Pork Council, Quaker Oats and Jif. What better way to sell more product than to encourage thousands upon thousands of recipe variations for Oatmeal Nut Waffles? I mean, one can never have too many Oatmeal Nut Waffles. Am I right? I usually don’t participate in these food holiday posts, only because I usually don’t know about them until the holiday is upon us. 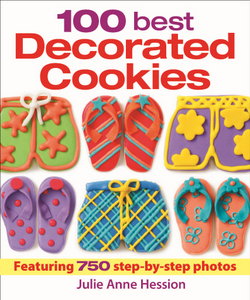 Then, instead of creating a recipe, I spend all of my time scanning the greeting card aisle at Target for the perfect last-minute way to say “Happy National Cheese Doodle Day” to Eric, when all of the good cheese doodle cards are already taken. I kid…..I kid. Seriously, I just never know about these holidays until it’s too late. Well, Saturday, SATURDAY was supposed to be the exception to the rule! Saturday, as you probably know, was National Pi Day…..as in March 14…….as in 3.14………as in 3.14.15.926 when it was 9:26 am on Saturday. That only happens once every century. The scientists were waaaay excited about that. So, naturally, food bloggers have turned Pi Day into Pi(e) Day. This was my chance. 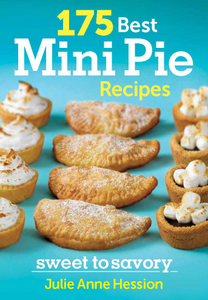 I mean, I’m the author of an entire cookbook dedicated to mini pies. 175 of them, to be exact. Posting a recipe on Pi(e) Day should be a piece of cake…….er……pie. Fail. I missed Pi(e) Day. So close. But wait! Things are looking up! 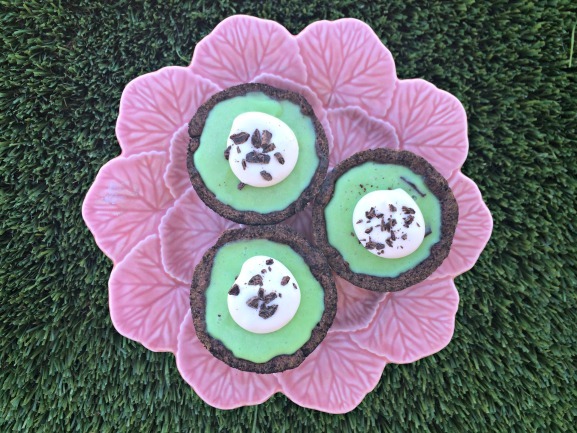 These Frozen Grasshopper Chocolate Mint Tartlets are green. Which means….. I even freeze some of my pies, like these tartlets. 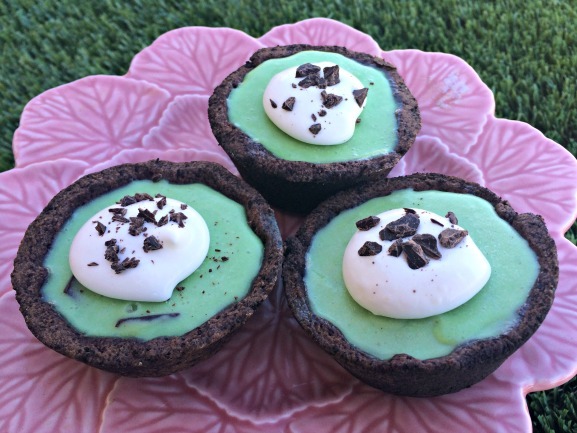 As you might have guessed, these mini pies were inspired by my favorite flavor of ice cream: mint chocolate chip. 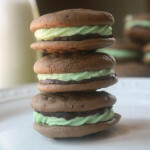 The creamy frozen filling is punched up a bit with some Creme de Menthe and Creme de Cacao, but you can always use mint extract instead if you want these to be alcohol-free. One trick that I like to do with some of my pie crusts is shown in the photos, above, and detailed in the instructions, below. Because cookie crumb pie crusts–such as graham cracker, vanilla wafer, and chocolate wafer–can often be crumbly and fall apart too easily, I like to roll the pie crust dough on a layer of the scattered cookie crumbs instead of on a lightly floured work surface. That way, the dough becomes embedded with the cookie crumbs. The resulting crust has the structure of a dough crust with the flavor and texture of a cookie crumb crust. 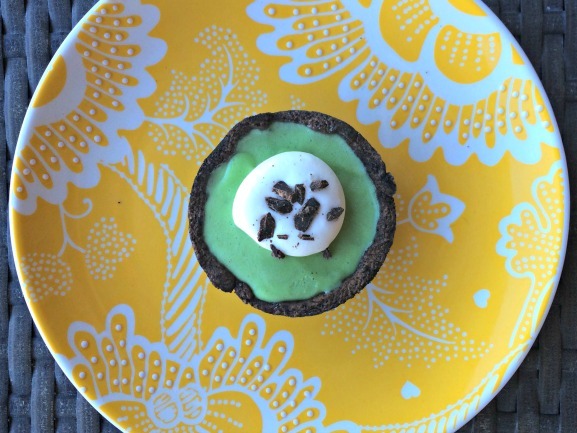 These chocolate-crusted mini pies have an ice-cream like frozen filling, inspired by my favorite flavor: mint chocolate chip. 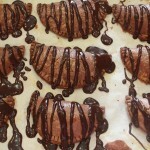 Rolling crushed dark chocolate wafer cookies into the dough creates a taste that mimics that of a chocolate cookie crust.....without the crumbly mess. 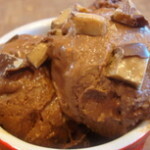 In food processor fitted with a metal blade, pulse flour, cocoa powder, sugar and salt to combine. Scatter butter pieces over the flour mixture and pulse several times until the pieces are the size of peas. Transfer dough to a large piece of plastic wrap and gather it into a ball. Flatten the ball into a disk and wrap it in plastic. Refrigerate for at least one hour before using. 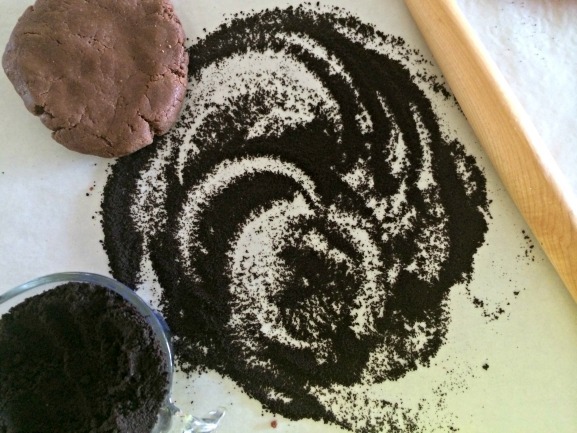 Scatter a lightly floured work surface with a handful of the cookie crumbs (see photos, above.) 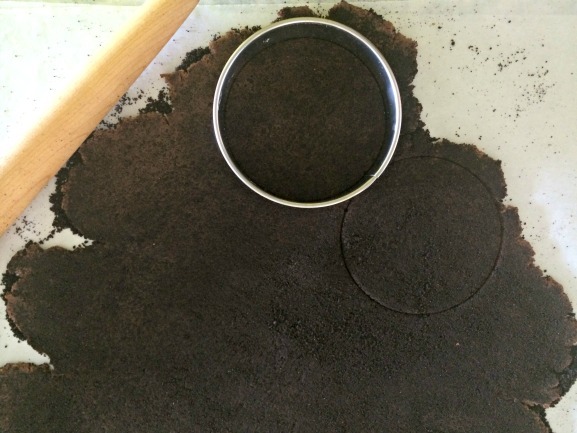 Roll out dough on the surface to 1/8-inch (3 mm) thick, so that the cookie crumbs become embedded into the crust. Using a 4-inch round cutter, cut into rounds and carefully fit into muffin cups (there may be some overlap.) Reroll scraps and scatter additional cookie crumbs as necessary. 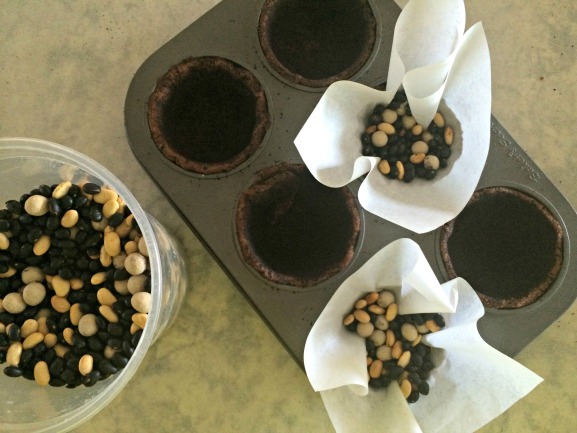 Blind bake the shells: Cut squares of parchment or aluminum foil large enough to line the insides of the muffin cups with a 1-inch overhang. You will need one square for each pie shell. If using foil squares, lightly butter one side (this will prevent sticking.) Press one square of parchment or foil (butter side down) into one pie shell. Weight the lining with pie weights or dried beans, filling almost to the top edge of the shells (see photo, above.) Repeat the process with the remaining shells. Bake the shells in the center of the oven for 12 minutes. Carefully remove the weights and parchment, and continue to bake until the shells are browned and set, 5 to 7 minutes longer. Let cool completely in pans. In a large bowl, whisk together yolks, cornstarch, sugar and 1/4 cup of the milk. In a medium saucepan, bring remaining milk and cream to a simmer. Slowly add hot milk mixture to egg mixture, whisking constantly, until smooth. Return the mixture to the saucepan and whisk constantly over medium-low heat until thickened, 4 to 5 minutes. Add white chocolate and whisk until melted. Remove saucepan from heat. Whisk in Crème de Menthe and Crème de Cacao. 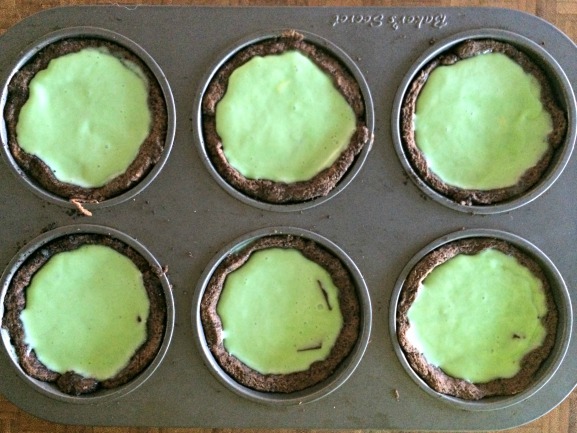 If you would like a greener color for your pies, whisk in a few drops of green food coloring. If you want a mintier flavor, add a bit of peppermint extract. 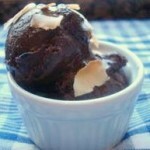 Cool completely, then whisk in chopped chocolate. Spoon about 2 tbsp (30 mL) filling into baked shells, smoothing tops. Transfer tins to freezer for at least 4 hours, or until pies are frozen. Carefully unmold and serve. Once pies are frozen and unmolded, they can be covered in an airtight container and frozen for up to 5 days.